What is Starlink: Battle for Atlas, is Star Fox in Starlink? A look at what Starlink: Battle for Atlas is and whether or not your favorite intergalactic fox will be included in the game. During Ubisoft's E3 2018 press conference, a new trailer for Starlink: Battle for Atlas dropped in conjunction with a surprise announcement. With things having died down somewhat, fans have taken to the internet to find out just what Starlink is and whether or not the reports of Fox McCloud from Star Fox being a playable game character are true. What is Starlink: Battle for Atlas? Starlink: Battle for Atlas is a sci-fi game set in a massive universe that spans seven explorable planets. Among Starlink's host of notable features is how the title blends gameplay with real-life toys. Essentially, Starlink is Ubisoft's attempt at the "toys-to-life" market. Other examples of this market include Skylanders and Amiibo, among others. "As you explore the Atlas Star System, you'll do so with a physical ship clipped to your controller. Using 'Smart Building Technology,' you'll be able to immediately swap out parts on the ship — including wings, weapons, pilots, and even the starship hull itself — and see them change in-game to meet the shifting demands of your situation as you experiment with different combinations, weapons, and status effects." Are there any special versions of Starlink: Battle for Atlas? Sort of, as the Nintendo Switch version of Starlink will include a familiar Nintendo pilot and ship. Yes, we're talking about Fox McCloud from Star Fox. Is Fox McCloud a Character in Starlink? If you've been wondering whether or not Fox McCloud from Star Fox is in fact a playable character in Starlink: Battle for Atlas, the answer is yes. However, Fox is only playable on Nintendo Switch versions of Starlink. 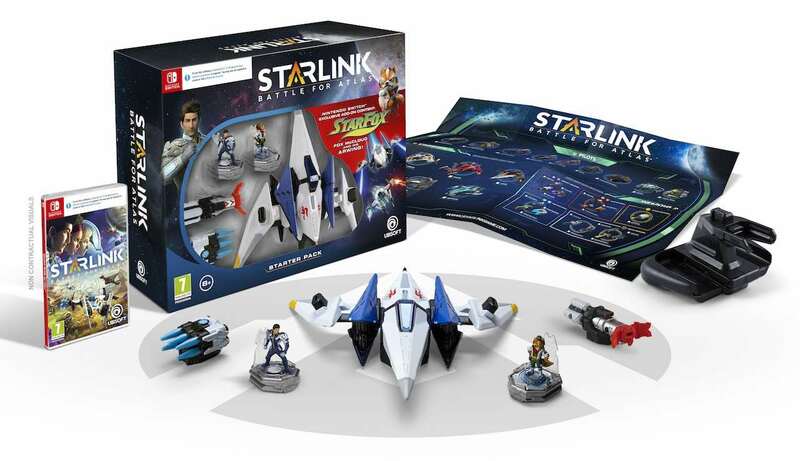 As added incentive for players to purchase Starlink on the Switch, Nintendo's Shigeru Miyamoto was pulled from the crowd during the Ubisoft press conference to showcase a new Starlink: Battle for Atlas toy modeled after an Arwing from Star Fox. You can only get the Arwing toy if you purchase a Nintendo Switch copy of Starlink. Starlink: Battle for Atlas is scheduled to release on Xbox One, PlayStation 4, and Nintendo Switch on October 16, 2018. Are you looking forward to the game? Do you plan on picking up a Nintendo Switch copy of Starlink so you can play as Fox McCloud? Let us know your thoughts down in the comments below, and stay tuned for more details on Starlink: Battle for Atlas!